The Colorado River Toad is the largest native species of toad in Northern America. 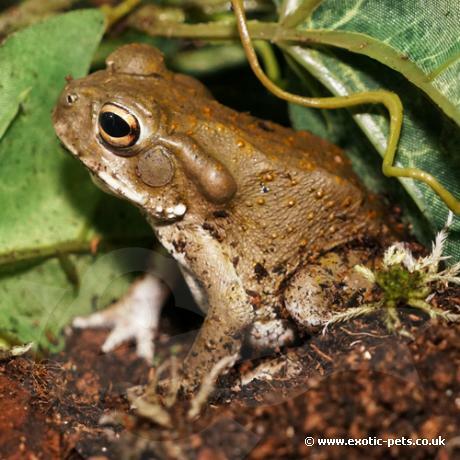 They are also known as Sonoran Desert Toads and rarely available for sale in the UK. What does the Colorado River Toad look like? Colorado River Toads are the largest native species of toad in North America reaching an adult size of 11-17cm (4.5-7 inches). Babies metamorphose at around 1.5cm; within two weeks they will double in size! They have smooth skin compared to other toad species with a few raised bumps. Their colour ranges in olive green, sometimes brown with frequent small orange or brownish spots. At the edge on the mouth a white wart is present, they have large ear drums and orange eyes with a vertical black pupil. IMPORTANT INFORMATION: The parotoid glands are large and along with the glands present on the hind legs will secrete a very toxic fluid. This contain 5-MeO-DMT (5-methoxy-dimethyltrypta mine) which is a powerful psychedelic tryptamine. These skin secretions also contain Bufotenin, a tryptamine that is related to the neurotransmitter serotonin and is similar in chemical structure to the hallucinogenic psilocin, a psychedelic mushroom alkaloid. These toxins are used as a self-defense against predators. Therefore caution should always be taken and hands washed when dealing with the toads or items in the enclosure! Where are Colorado River Toads from? They inhabit both desert and semi-arid grasslands, normally always close to water. As the name suggests, they are found in the lower Colorado River and Gila River in South eastern California, New Mexico, Mexico and most of southern Arizona. They will hide within rodent burrows during the day and leave to hunt at night. How do you keep Colorado River Toads? Colorado River Toads are a hardy species to keep if a few simple steps are followed. These toads grow big, therefore adequate space should be provided, especially if you are keeping a few together. We would recommend a minimum 4ft glass tank, ensure this has a secure lid as they are strong and can escape easily. By using a Glass Terrarium, front opening doors allow access for feeding and maintenance; the tops have a mesh lid allowing lighting and heating to be placed on top. The substrate should be a depth of 3-4 inches to allow natural burrowing during the daytime heat. A variety of substrate can be used from coir, cypress mulch (zoo med forest floor) and sands. By using a mixture of a ProRep Life Series and the cypress mulch you can create a natural look. During the day, Colorado River Toads will either use abandon rodent burrow, hide under or within rock crevices or dig into the substrate. Daytime temperatures should range between 24-26C (74-80F) and allowed to drop down to 13-18C (55-65F) at night. It is at these cooler night temperatures when they emerge to feed. Some people say UVB lighting isn’t essential however we use this on all our animals as we believe they do benefit from natural light. Although the Colorado River Toads are known as desert species, water is very important and should always be provided as they naturally live close to water and should never be allowed to become dehydrated. Misting in the evening will encourage them to leave burrows to feed. They will eat pretty much anything you give them from a range of live insects to defrosted rodents. Caution should be taken as they can become over weight. As with all exotic pets, food should be dusted with a vitamin and mineral powder twice a week and the remaining feeds with calcium.